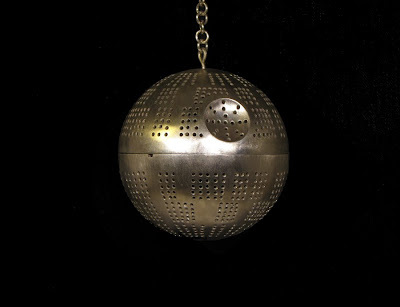 That's no moon; it's a tea ball. Artist TimJo has created a working Death Star tea infuser made with real silver sheet metal and it's undeniably the best thing to happen to tea since it was first paired with cookies. * Unfortunately, the infuser isn't for sale at this time but there's always (a new) hope. *Why do the bad guys always get the best afternoon refreshments? Why must you tease us with nice things we can't have? Because I'm a cruel, cruel Moxie and I like having a chance to show off my evil genius laugh. MUHAHAHHAHAHAHA! I want this so bad, you have no idea. I wonder if you could find someone on Etsy to make something similar for you. I've done that before for custom key fobs and it worked out really well.